The Diamond Sutra’s Chinese localization has not changed the meaning of the sutra, but it has influenced the way it is practiced and the attitude people have towards the sutra, altering the relationship between Buddhists and the sutra and the role the sutra plays in people’s lives. 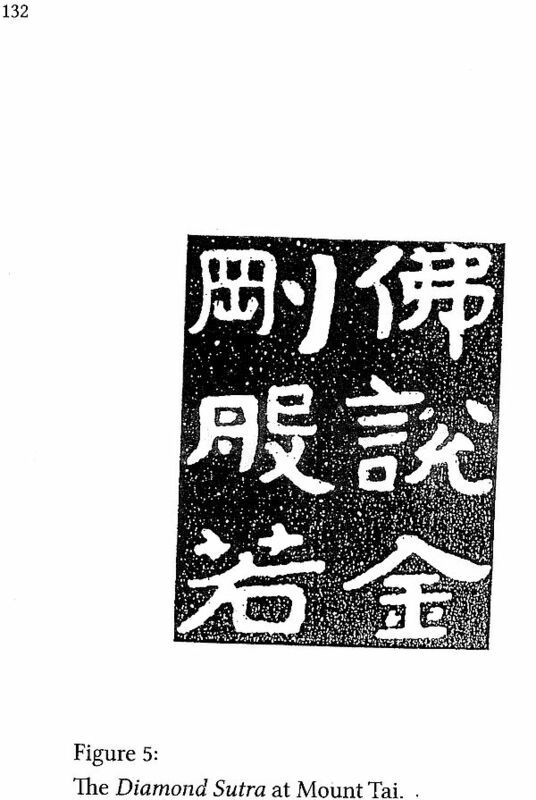 This simple text has been empowered, transformed, and personalized in the Chinese Buddhist mind. 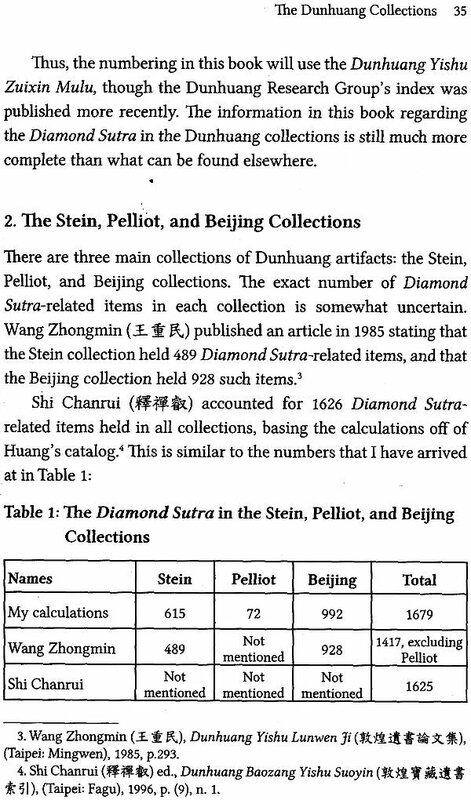 The Diamond Sutra in Chinese culture examines the impact of this very important religious text upon Chinese religion, culture, art, literature, folklore, and technology. 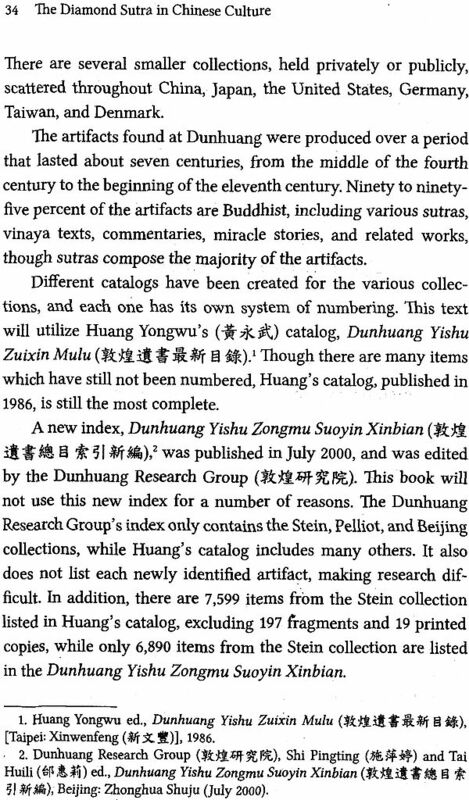 Based largely on those artifacts found in the Dunhuang collections, which comprise the oldest Buddhist manuscripts in the world, The Diamond Sutra in Chinese Culture offers insightful new research and a compelling perspective on the influence of this very important text. The Diamond Sutra is one of the most important sutras in Chinese Buddhism, and it has had a great influence on Chinese culture. 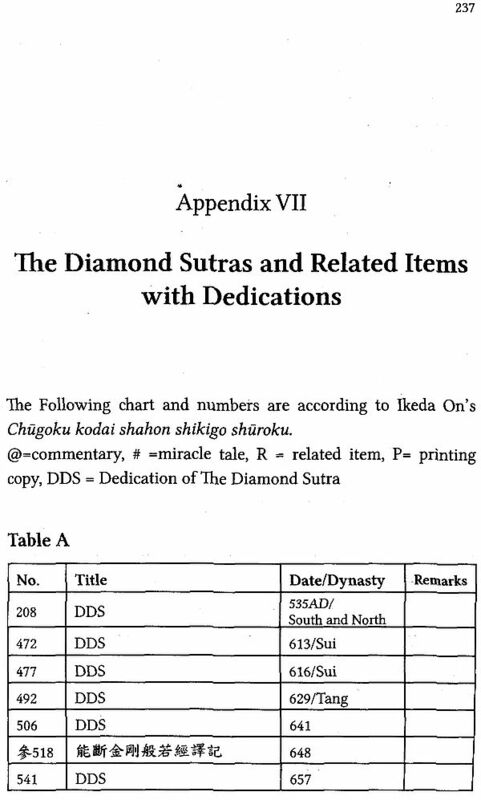 It is called the Diamond Sutra because the Buddha’s teachings within it are like a diamond that cuts away all delusion, reveals reality, and brings people to enlightenment. The main themes in the sutra are giving without clinging to any notion, liberating all beings with the notion of a self, living without attachment, and cultivating without any expectations. 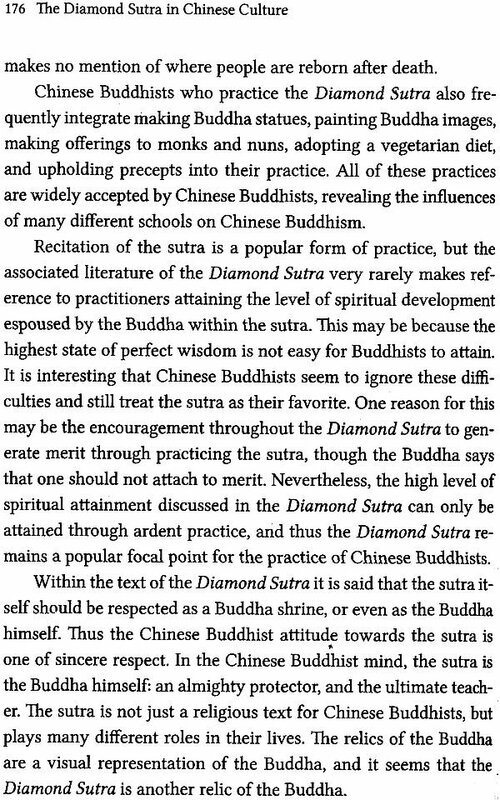 The essential teachings of the Diamond Sutra are prajna (wisdom) and emptiness. This book will seek to examine the sutra from a cultural perspective, using it to examine Chinese people’s lives and thought, as well as the literature associated with the sutra. 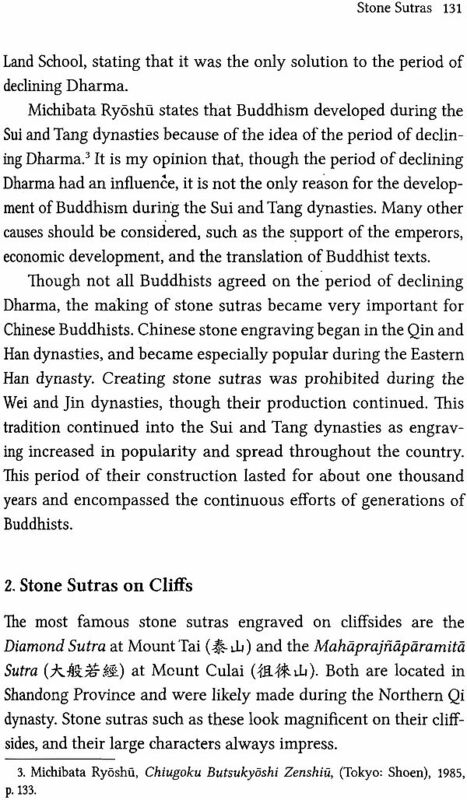 The sutra has been very popular in Chine since the first Chinese translation by Kumarajiva which was made at the beginning of the fifth century. 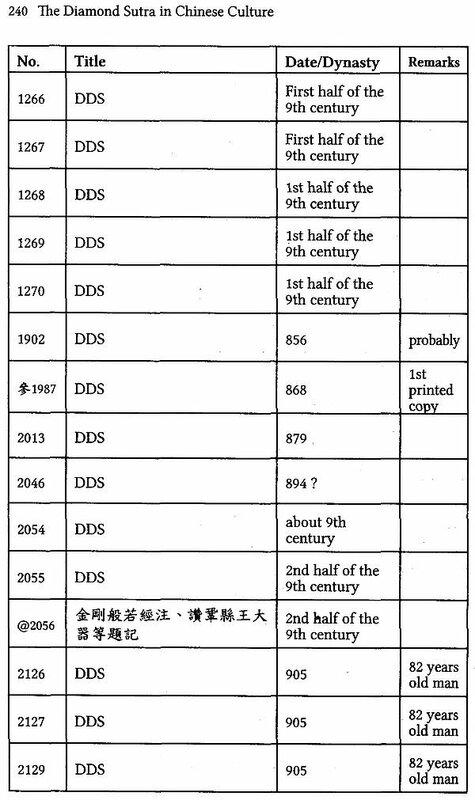 This book will focus on the periods prior to the eleventh century– before the Song dynasty. 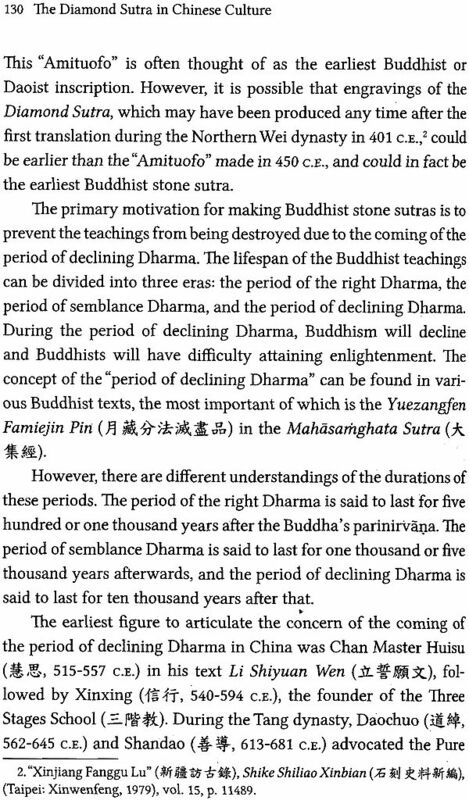 It will cover the periods when Buddhism flourished in China, such as the Sui and Tang dynasties. 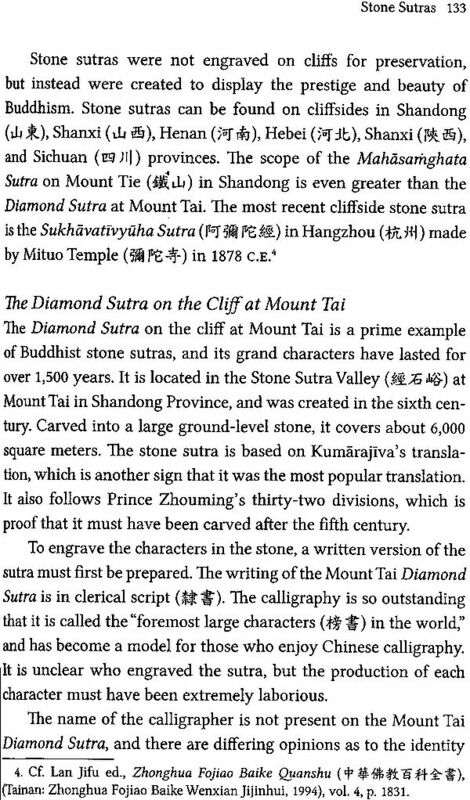 In the beginning, the Diamond Sutra was just an Indian Buddhist text translated from Sanskrit, but it has since been localized and completely integrated into Chinese culture and the lives of Chinese Buddhists. 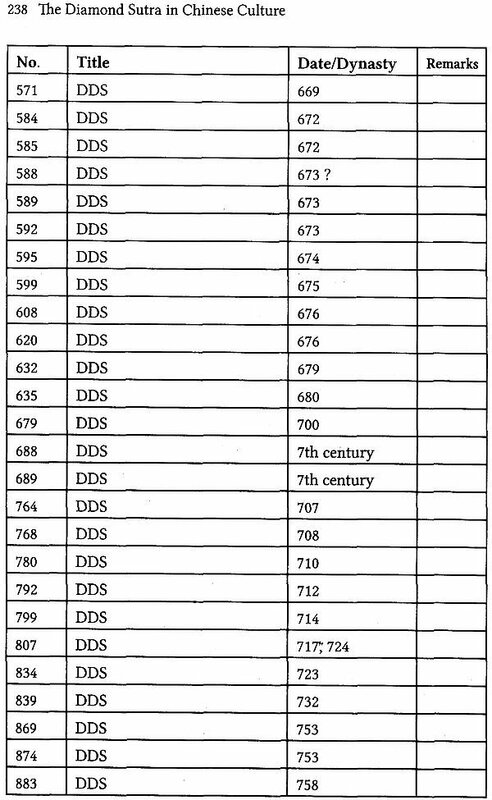 It is not simply a text, but a living scripture which has an active relationship with many aspects of the lives of those who practice it. 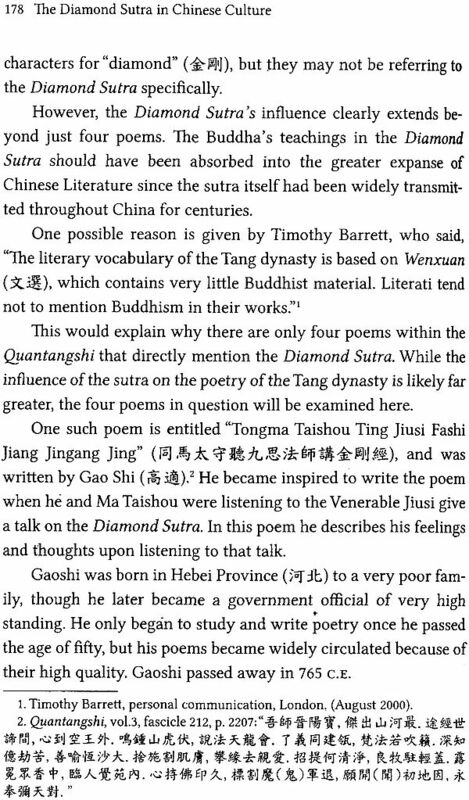 The Diamond Sutra and its devotees have built up their own culture, their own “scripture culture,” in China. 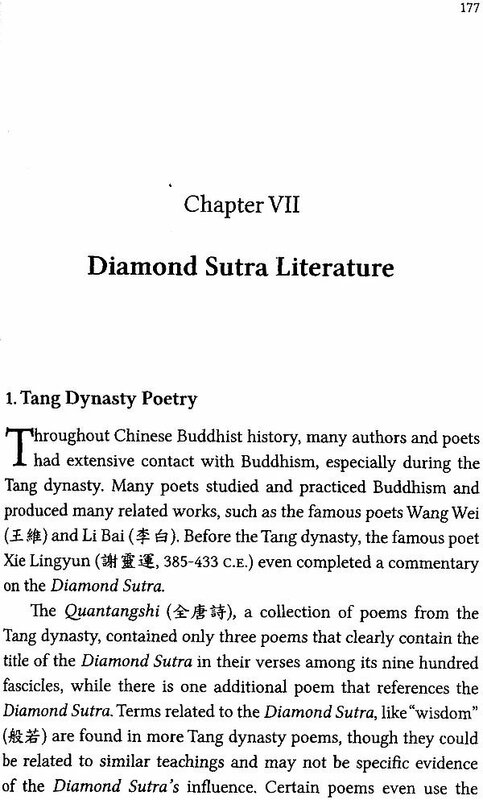 This work will explore the phenomenon of the Diamond Sutra’s scripture culture in China before the Song dynasty. 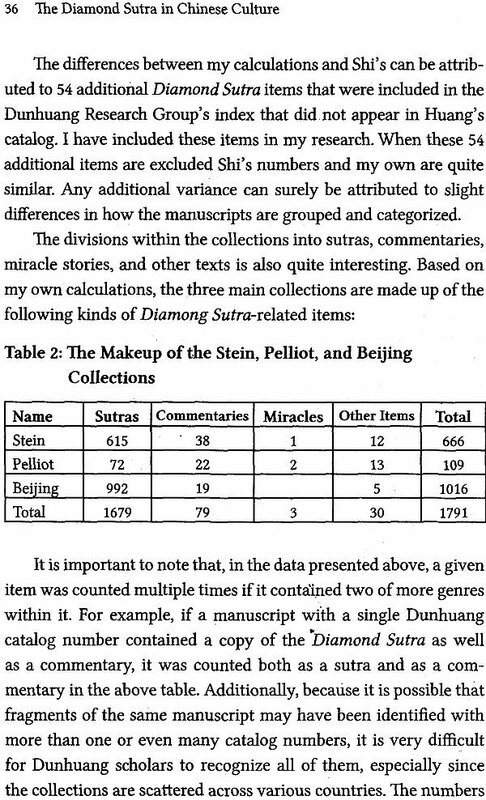 It will examine the various translation and commentaries of the Diamond Sutra, as well as the miracle stories, stone sutra carvings, historical accounts of practice, and the literature associated with the sutra with a special emphasis placed on those materials and manuscripts found in the Dunhuang collections. The Buddha’s teaching transcend national and cultural differences. 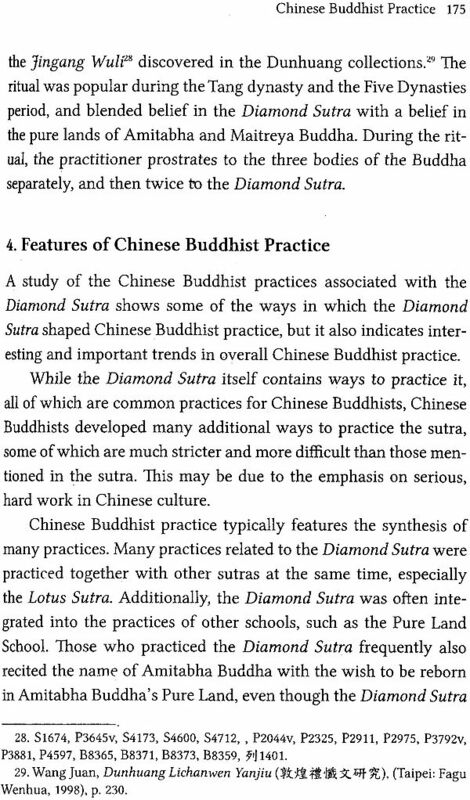 The Diamond Sutra’s Chinese localization has not changed the meaning of the sutra, but it has but it has influenced the way it is practiced and the attitude people have towards the sutra, altering the relationship between Buddhists and the sutra and the role the sutra plays in people’s lives. This simple text has been empowered, transformed, and personalized in the Chinese Buddhist mind. 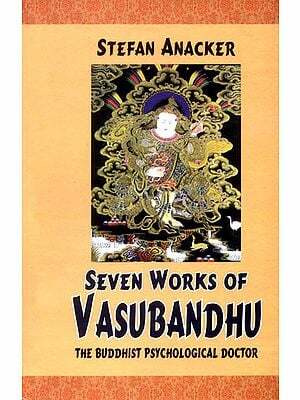 This work draws from many sources, both Buddhist and non-Buddhist. Most are from the massive Dunhuang collections: different kinds of stone sutras, collections of miracles stories, biographies of monks and nuns, literary collections and other works. 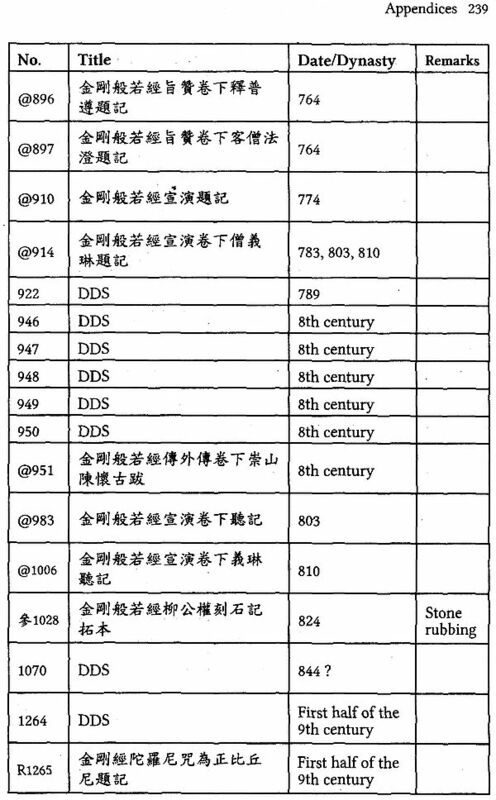 Such sources and research draws from many different languages, but most frequently from Chinese, English, and Japanese. Investigating the Diamond Sutra from a cultural perspective is a special frontier– different from previous research to this text. Rethinking the sutra from a cultural perspective necessitates the concept of scripture culture: the unique culture created by the Diamond Sutra and its followers in China. The Large Sutra on Perfect Wisdom "With the Divisions of the Abhisamyalankara "